This bottle of Talisker 18 was a gift from my wife who knows I am a huge fan of Talisker’s 10-year-old, and knows I was blown away by the Talisker 25 I had in a New York restaurant. (That was Aureole, a great combination of superb food and service without pretension. A Michelin starred restaurant, and there were folks eating there in jeans and t-shirts…) But I digress. When I woke up Christmas morning and found this bottle stuffed in my stocking I broke out in a broad grin. Santa sure knows my taste. 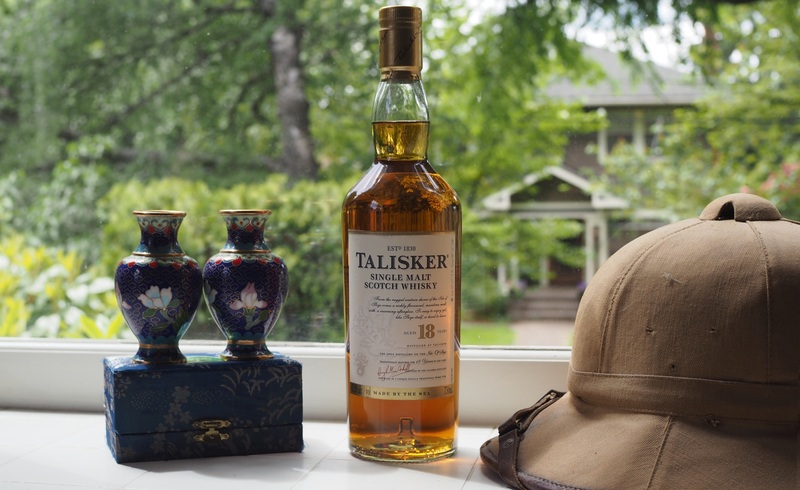 From the photo above you can see the understated carton and classic design of the Talisker bottle. The label looks like one you could find going 50 years into the past: classic fonts on a cream-colored background. A map of the island (Skye) and their roaring mer-lion fading into the background. Pretty typical Diageo. The color of the spirit is ‘russet muscat‘ and exactly the same as the 10 (see second photo). That they match so well makes me suspect a little bit of alchemy at the bottling. You would think an extra 8 years would render a darker whisky. 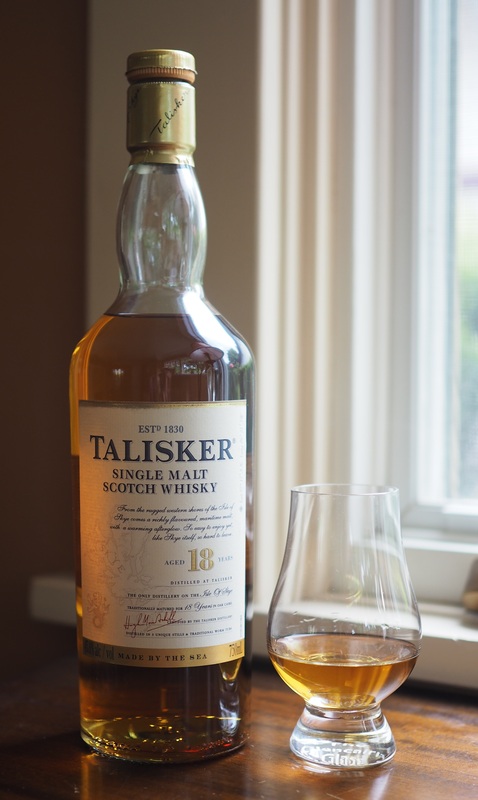 The first thing you notice when pouring a Talisker is the aroma. This is not a shy whisky that waits for you to stuff your nose in the glass…it comes and gets you. The air within a few feet of your Glencairn glass will carry that unique combination of seaweed, peat, and a solid midrange of malt and fruit. 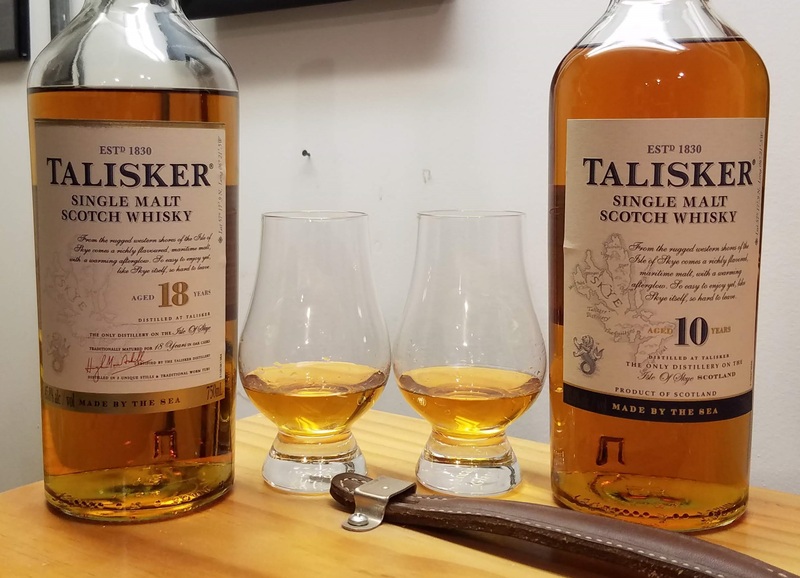 Since both the 10 and the 18 are bottled at Talisker’s odd 45.8% strength, we can do a solid head to head comparison on aroma. The 18 is very similar to the 10, though smoother. Whereas the 10 can sting a little in a deep draught and has noticeable aromas of drying grass and grapefruit, the 18 is smoother on the nose and less grassy; the 18 is more citrus peel than citrus, carrying as well heavier notes of prune, fig, and worn leather — hence Diageo listing it on the ‘rich‘ side of their tasting chart, versus the 10 being on the ‘light‘ side. Both have a solid background of peat – reminding me of the peated barley we sampled at one of our tours (Caol Isla IIRC). The peat is not overpowering by any means, which is why I love Talisker so much—it’s not heavily phenolic like a Laphroaig (in fact the Diageo folks rate this on the ‘lighter’ side of their tasting chart), but it is complex, balanced, and a treat for the palate. On the palate, the 10 has a wonderful foretaste of caramel, followed by citrus and peat, a little peppery on the tide of the tongue and the citrus lingers into the aftertaste, where the oak really comes forward—not too bitter but definitely a strong note. About the Caol Isla 18: it is a different beast entirely. I had to add a little water, it being almost 60% ABV. The Caol Isla 18 has a lighter aroma and palate, with toffee (but not as carmelized), grassy notes more like the Talisker 10, and of course no peat. The sweetness is lighter, and the finish smooth and not as interesting as either Talisker. Not as much punch. I would consider the Talisker altogether a more interesting dram, even outside the peatiness. Color me surprised. The Caol Isla single casks we tried at our tasting, and the Moch NAS that the wife brought back, have a magic I think is missing from the unpeated variety. Nose: Gentle, but aromatic! Seaweed and saltwater, peat smoke, malt, citrus peel, figs. Palate: Toffee, honeysuckle, vanilla, peat smoke and burnt seaweed, a bit of that ‘old spirit’ leathery/meaty magic, less so citrus peel and a touch of peppery/listerine medicinal liveliness around the edges for balance. None of these dominates or is abrupt. Finish: Lengthy. Toffee, vanilla, oak tannins gently fading in to balance the sweet side, but not a trace of harshness. The peat rides on as well! A little of the listerine-medicinal/citrus peel from the palate. Bottom Line: The great 10-year expression is a tough competitor. 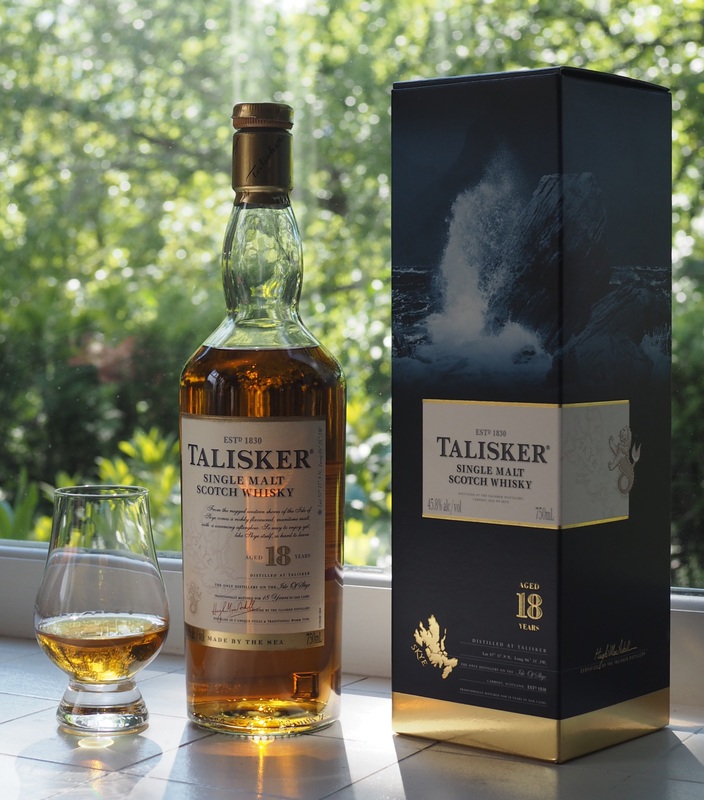 While the Talisker 18 comes in with refinement and improved mid-palate richness, is it enough? Or is it too laid back? The price is not outrageous for an 18-year-old, in fact it’s about even with the Highland Park 18 (coming soon to this blog BTW). But it is not cheap and I think about the 25-year I had in New York which blew my mind and wonder if this is a spirit that reaches its pinnacle with just a few years more. Where the 18 shines is in the aroma and finish. I find it enjoyable just having a glass poured somewhere in the room, and the finish lingers on for paragraphs. This entry was posted in Scotch-single malt, Whisky and tagged Scotch, single malt, Skye, Talisker. Bookmark the permalink.